Hello and Welcome to George Clooney Aficionados. We hope that you have fun and enjoy spending time here with us discussing George and anything else you want to in our “Just For Us” area. Please let us know of any problems or issues and we will do our very best to address them. George Clooney Aficionados is a forum for, and by, George Clooney fans. It is NOT an official site. Aficionados has no contact with George or his management team, so don’t use this as an alternative to writing a fan letter to him. This is a place where we his fans can gather to share information we find, where we can have discussions about his film and humanitarian work and about him in general. Mercado, Casey, Charley and Sisieq are the founders of George Clooney Aficionados and all of us have been on George Clooney forums for many years. As Clooney fans we want to participate in the forum but all of us are Admin, so anytime BATMAN appears, it could be any one of us. No one administrator controls this board, so if we need to enforce a rule or admonish a poster we will do it after conferring with each other and we will do it as Admin. Gentle moderation we’ll do under our usual nics. The main categories and their forums are there. The topics will take on lives of their own, and will be dictated by circumstance. Naturally you each have the ability to start a new topic, but as we’re more interested in what George is doing, we’d ask that all articles/pics/discussions of his ex girlfriends be in the one topic ie ALL posts about anything Elisabetta Canalis has done or is doing should go in the ONE forum named Elisabetta Canalis. And the same principle applies in the Films category, all discussions about his films should stay in the one topic ie everytrhing about “The Descendants” should be in the one forum. Sometimes discussions in forums will go slightly off topic, or will intertwine (Elisabetta Canalis was in Hawaii for some of the time George was filming “The Descendants” so there could well be discussions in either of those threads about the other subject) but someone will always bring it back on track. We will do our best to keep this place troll free and we ask if one does appear, and we can guarantee they will at some stage, that you ignore them. Any attention you give a troll will just encourage them and it doesn't matter what you say the troll will disagree with you. We will remove them as quickly as possible. Trolls offer nothing but can cause issues for other posters and we have all had experiences with several over the years. So the best action is no reaction and we will ban them as soon as they are spotted! Of course there will be times when you may not agree with what another poster says and we ask that everyone remembers we all have our own opinions and ways of saying things. Respect each other and if an argument breaks out we expect posters to behave like adults and accept that while you may not agree with something said, the other poster has just as much right to say what they think as you do. We will only step in if things get too heated but we hope as we are all adults we can accept what others say and move on. We do not allow any bullying of members here. If someone’s posts are not to your taste you can let them know but we won't allow a group of posters or anyone for that matter to call another poster any names or deride their posts. Everyone has the same right of making comments true to them. This site was created so people could have a choice in where they posted. Every site has its own vibe and we hope ours is a fun and relaxed one. This site will not suit everybody and that is to be expected. We do not and will not put up with any negative comments about any other George Clooney site or person/s from that site. That is not why this board was created. The one area of any George Clooney forum where there is bound to be differences of opinion is the forum about his girlfriends. Whether it be the girl he is with or rumoured to be with or his past girlfriends, this is the area where most arguments break out, and where someone is more likely to be offended by "blunt" talk. So the "Romances" forum is by request only. Don't be put off by this warning though. If you do join and find it's not for you, we can remove you from that group or you can just choose to stay away. If you don't want to talk about George's love life there are plenty of other threads and areas you can go to talk about George. It's said that in polite company you never discuss religion or politics. We don't have a category about religion (and we won't) but George's political views are well known and often the subject of newspaper/magazine articles. But because politics can be such a controversial subject we have also made that forum by request only. We are very relaxed and really want this forum to be fun and a place you enjoy coming to. 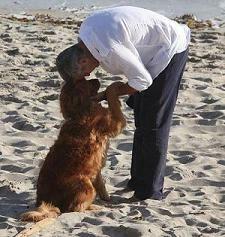 We will try and keep it a safe and happy place and of course informative and up to date with any George Clooney news. Please feel free to post pictures or stories you may come across because everyone's input is considered valuable. Don't be scared of posting something in the wrong thread - we all do it and it can be fixed! So take off your shoes and have some fun. Now it’s over to you. George Clooney is a fascinating man with many sides to his persona. There’s plenty about him for us to discuss and enjoy.